After using the same vise for around six years now, I decided to upgrade to a Peak rotary fly tying vise. I did a lot of research and looked at several vises for a few years before decided on this one. Another big contender in my search was the Renzetti Traveler and of course a Regal. The Regal was a little too far out of my price range, but I do like their vises a lot and appreciate the craftsmanship that goes into making them. I’ve never had a rotary vise, so I was interested in trying one out. So far, I love it. The ability to turn the vise while wrapping dubbing or hackle is a huge plus, and took me a little time to get used to it. I prefer having the pedestal base over a clamp vise. I like having it centered on my table rather than hanging over the edge, and the heavy base keeps it extremely steady on my table while tying. I’ve also never had a bobbin holder, so it’s been interesting incorporating that into my tying. The peak has a lot of different options, and you can completely customize the way you tie with it over time. I like that the bobbin holder pivots so easily, so that I can move it into and out of place as needed. It also feels extremely solid, and the clamps tighten up quite well. I tie many flies in sizes 24 and smaller, and I was worried I might need a midge jaw to go that small. So far, I’ve tied a size 26 with no problems at all. The other reason I choose this vise over others is the price. At a $154.99 retail price point, you can’t really beat that for the quality and design of this vise. 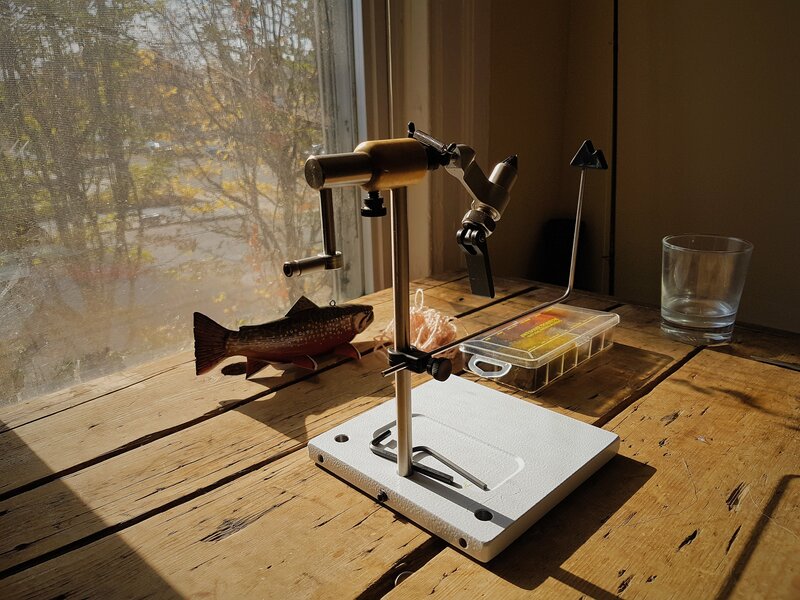 I actually ended up buying mine from another angler that runs a small business, and ended up getting the vise, two material clips, and the d-arm for a bit less than $130. I think it’s important to support local shops and angler owned businesses whenever possible. I try to avoid buying my fishing gear, supplies, or fly fishing books from places like Amazon. Readers of the blog may have noticed that I’m quite thrifty, and I am willing to wait for a good deal. Much like angling, I find that patience and persistence always rewards! Here are a few pictures from my newly established tying corner in DC. I made it out to the Gunpowder River in Maryland for a few hours already, and had a lot of fun.